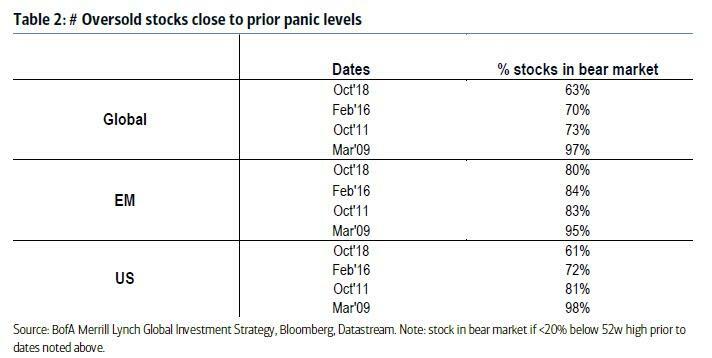 "10 Thoughts On The Recent Equity Market Sell-Off..."
With traders, analysts, strategists not to mention mom and pop daytraders stumped, and transfixed by the latest market selloff, terrified by the lack of a bounce and the absence of BTFDers, everyone appears to be "bearing up", uncertain how much lower the drop can take the market, which is only where it is thanks to trillions of liquidity created out of thin air by central banks - liquidity which is now being drained at an accelerating pace. So, in an attempt to make some sense of the recent liquidations and explain the sharp market selloff, Bank of America's chief investment strategist Michael Hartnett has shared "10 thoughts on the recent equity market selloff." 1. It’s (almost) officially a global equity bear market…MSCI equal-weighted global index down 19.6% from intraday high Jan 29th. Italy-Germany bond spread +200bp (to 315bp), EM debt +100bp (to 297bp), EU HY +150bp (to 387bp), cost of hedging US HY corporate bonds @ 2-year high. 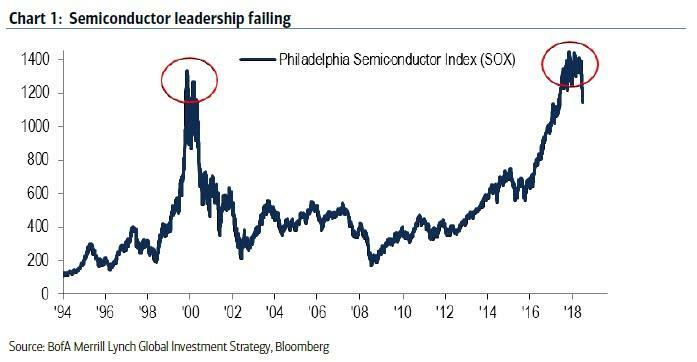 FAANG stocks -21% from highs, semiconductors -22% from high (having failed to take out the 2000 high in the cyclical SOX index). 1742 of 2767 global stocks, 919 of 1150 EM stocks, 1164 of 1899 NYSE stocks in bear markets. 3. Big picture explanation: it’s late-cycle and Fed tightening; Table 1 shows excess returns from US large cap stocks & corporate bonds past 10 years vs. past 100 years; 8 hikes into Fed tightening cycle + end of QE and in 2018 volatility rising, returns stumbling. On positioning: BofAML Bull & Bear Indicator slumped from excessively bullish 8.6 in Jan to 3.1 today, but we are yet to breach excessively bearish level of <2.0; unwind of CTFC crude oil longs, EM fund outflows >$30bn & HY outflows >$15bn next 4 weeks would get us below 2.0; until then only “dead cat bounces” likely. PMIs falling; BofAML quant strategists say global EPS revisions @ 2-year low (link). 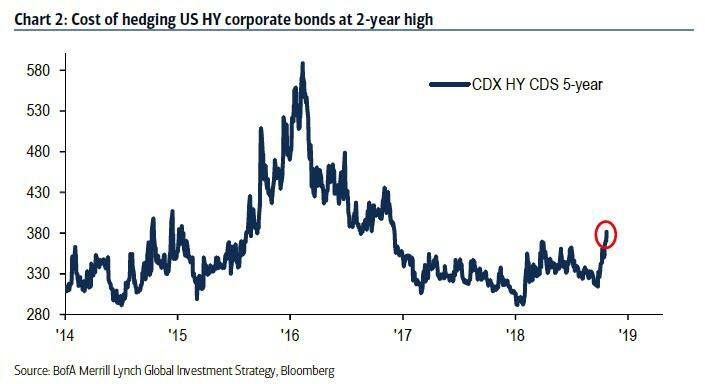 On policy: Fed yet to blink, China stimulus yet to bite; markets stop panicking when central banks start panicking…until then sell rallies in risk, cash over bonds & stocks, high quality over highly leveraged assets. 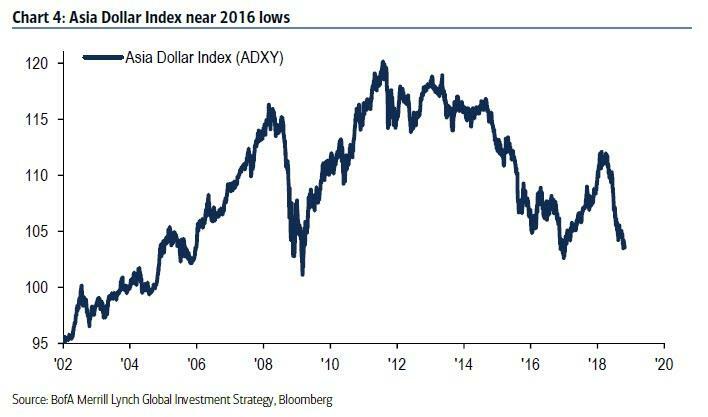 (Note China for geopolitical reasons may be content to gain leverage over US by allowing Chinese stock/FX markets to threaten US financial conditions). 5. Equity markets very oversold: 63% of global stocks in bear market (80% in EM, 61% in US – Table 2); at 2011 & 2016 equity market lows this figure maxed out at 70%...tells you if this big correction not harbinger of recession/crash, excellent entry point would coincide with better policy news (at 2009 recessionary lows almost every stock in index in bear market). 6. Bad sign that oversold markets not bouncing: BofAML Breadth Rule flashed contrarian buy signal on Oct 11th; bear market leaders (EMB, XHB, SX7E, BKX, SOX) still falling, bear market laggards (oil, RTY, HY, FAANG, PSP) only recently cracked; inability of oversold markets to bounce suggests investors worried by either systemic financial market event or recession. 7. 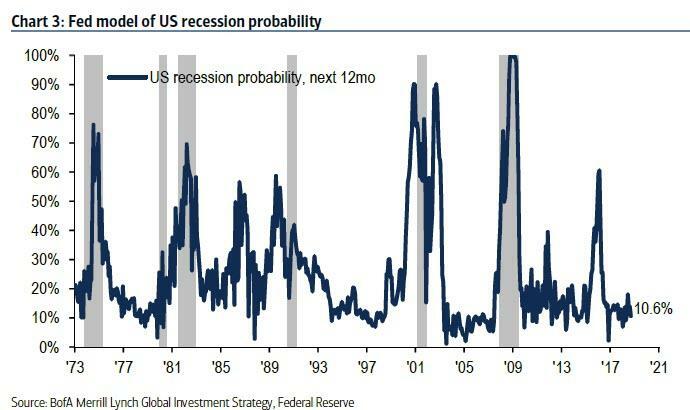 Odds of US recession according to Fed model = 10.6%; since ‘74 when these odds >30% US PMI has fallen <50 (i.e. profit recession) on 9 out of 16 occasions; we believe a. drop in oil prices at time of tight supply, b. inability of SOX index of semiconductors (epicenter of tech) to recover, and c. as per Fed model the “big tell” for recession = flatter yield curve coincident with sharp widening of corporate bond spreads (e.g. +50bps in US IG to 170bps). Today the S&P 500 index of 2656 assumes $162 of EPS on a PE of 16.4x; Table 3 illustrates some potential stock market outcomes assuming +/- 10% EPS growth on long-term or 2018 average multiples; 2500-2600 looks range to return to risk. 8. 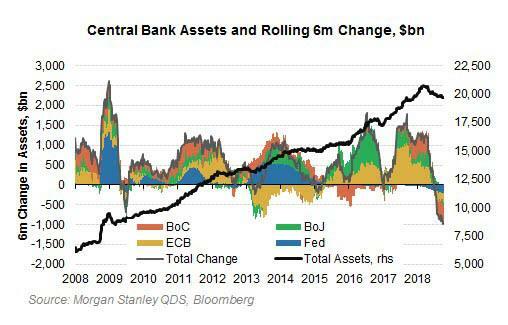 Crash watch: $45tn of systemically risky shadow banking assets (source BIS), of which 72% (in bond ETFs, mutual funds, credit HFs, bank loan funds) are vulnerable to forced selling (note record $14bn outflows from IG funds past 10 days = 4sd event); record $4.2tn of CRE (commercial real estate) debt outstanding, and 73% of loans in CMBS last 9 months interest-only; ‘87/’98 “late-cycle” crashes coincident with policy disputes & currency volatility (watch ADXY <100); there are vulnerabilities and therefore catalysts for higher volatility. 9. Bear trades (and we remain bearish): high quality defensive assets, gold, cash, volatility; sell corporate bonds & oil as last dominos to drop. 10. Bull trades: rate-sensitives (REITs, homebuilders), distressed cyclical value (EM bonds & FX, Europe, industrials, autos, banks); oversold tech (SOCL index).